Front of the recipe card for Tuna Noodle Casserole. 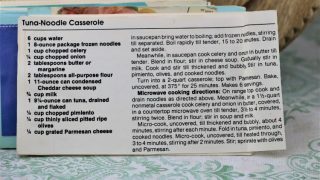 There are lots of fun recipes to read in the box this recipe for Tuna Noodle Casserole was with. Use the links below to view other recipes similar to this Tuna Noodle Casserole recipe. 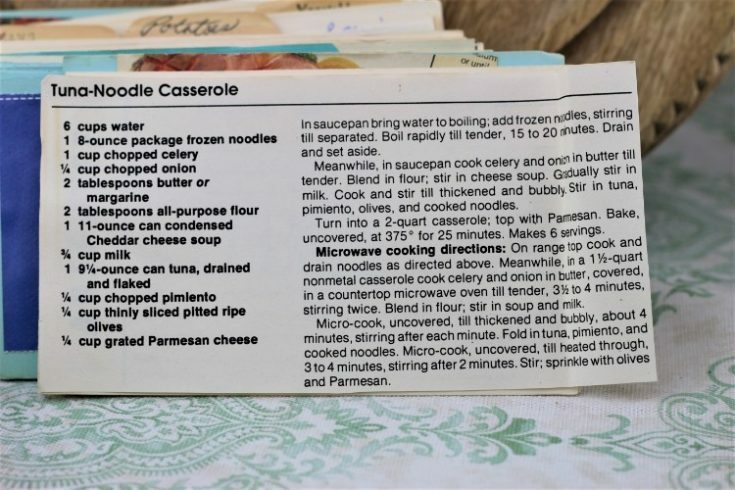 If you make this Tuna Noodle Casserole recipe, please share your photos and comments below! In saucepan bring water to boiling; add frozen noodles, stirring till separated. Boil rapidly till tender, 15 to 20 minutes. Meanwhile, in saucepan cook celery and onion in butter till tender. Blend in flour; stir in cheese soup. Stir in tuna, pimiento, olives, and cooked noodles. Turn into a 2-quart casserole; top with Parmesan. Bake, uncovered, at 375° for 25 minutes. On range top cook and drain noodles as directed above. Meanwhile, in a 1½-quart nonmetal casserole cook celery and onion in butter, covered, in a countertop microwave oven till tender, 3½ to 4 minutes, stirring twice. Blend in flour; stir in soup and milk. Micro-cook, uncovered, till thickened and bubbly, about 4 minutes, stirring after each minute. Fold in tuna, pimiento, and cooked noodles. Micro-cook, uncovered, till heated through, 3 to 4 minutes, stirring after 2 minutes. Stir; sprinkle with olives and Parmesan.